There are generally two routes to Skymont, from the West via Interstate 24 over Monteagle and from the East via SR-111 across Flat Top Mountain. 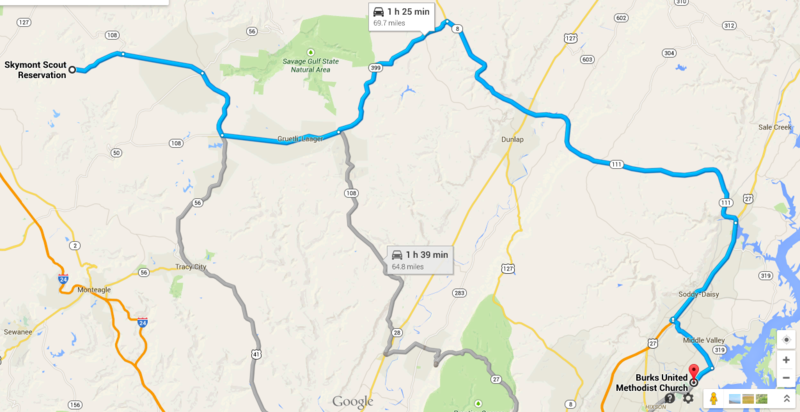 These directions take the SR-111 route which is probably the best route for Scouts North East of Chattanooga. Travel time from the Hixson area is about 1.5 to 1.75 hours. Take US-27 North across Soddy Lake and go left (North) onto SR-111. Continue on 111 for 25.9 miles, across Flat Top Mountain, across the Sequatchie Valley and up Cagle Mountain to SR-399. From Dunlap, continue on SR-111 for 8.5 miles to SR-399. Turn left (West) onto SR-399 at the Mount Pleasant Congressional Methodist Church. There is a sign for Savage Gulf State Park. Continue on 399 for 10.8 miles. Turn right (North) onto 108 at Layne Funeral Home. Continue on 108 for 7.2 miles. Turn right (North) onto 56. Continue on 56 North for 4.8 miles. Turn left (North) onto 108 after The Manor Bed and Breakfast Inn and continue for 5 miles. Note: There is a Skymont sign past The Manor Bed and Breakfast Inn. Don’t turn on 108 South before The Manor Bed and Breakfast Inn. Turn left onto Cabbage Patch Road after mile marker 23. There is a Skymont sign there as well. Continue for 3.4 miles. Turn right into the Skymont entrance. Stay to the right at the split, unless you are going to the Winter camp.